One of the poets in this book speaks of “First Breath” and “Last Breath.” Here are American poets who have “breathed in” the breath of such Chinese poets as T'ao Ch'ien, Han Shan, and Wang Wei. And here they breathe it back out again where it mingles with the breath of America. T'ao Ch'ien (365-427 C.E.) is a major figure in the Chinese poetic tradition whose influence on subsequent generations cannot be overstated. After holding several official posts he abandoned a traditional government career for the life of a reclusive gentleman farmer. His poems, expressed in natural language, reflect on ordinary daily occurrences and express a deep connection with nature. Despite their accessibility and seeming simplicity, they are deeply philosophical. 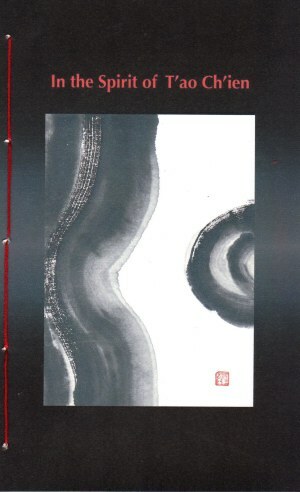 The poems in this collection share characteristics with T'ao Ch'ien and other poets of ancient China. They are plain spoken, clear, generally short, and readily understandable. These poems explore the poets' states of consciousness and relationship with the natural world as they seek a self-understanding, as well as a connectedness with all that surrounds them. These poems document human relationships, and the comings and goings of other people in the poets' lives. When these poets address issues in the wider world, they see through the smoke and mirrors of officialdom and are critical of social injustice. rivers come down from mountain summits. nearby trees barely in view. only slow lightening of sky. homemade bread toasting on wood stove. right here, the center of the world. this morning with the woman. there's no way you'll ever find me. is an 84 page hand-sewn paperbook with spine - $16.00.